My Very First Blog: Let The Games Begin! It was 6.45pm on Friday and I was trapped in a massive traffic jam in New Town, PJ. What the hell was happening? It was bumper to bumper crawl. This was very unusual. I tried to navigate through the traffic and tried and find the best route home. 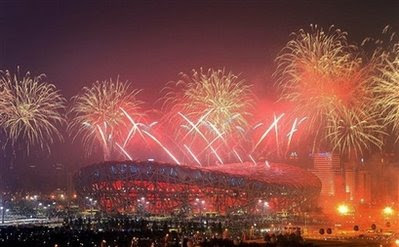 I’d be damned if I miss the opening ceremony of the Beijing Olympics! Oh, that’s it! Only then did I realize what the traffic jam was all about. People all rushing home to catch the Olympics! I was hungry but with the traffic condition like that, I think I’d just forego my dinner outside and head straight home. Trouble was, the clock kept ticking but my car was not moving much. I was beginning to lose my patience. It was 7.50pm and I was no where near home! Maybe I should just have my dinner at a mamak stall and watch the Olympics on the TV there. Luckily, for me, and to cut the long story short, I managed to reach home at 8.25pm. But with no Astro and relying on RTM, it would make no difference even if I came back later because they only broadcasted it at 8.40pm after the news. What the crap! The opening ceremony started at 8.08pm and RTM, our official Olympics channel showed the live telecast about 30 minutes late! Better than nothing, of course so I watched the opening ceremony and all. It was a great opening – truly grand and entertaining. 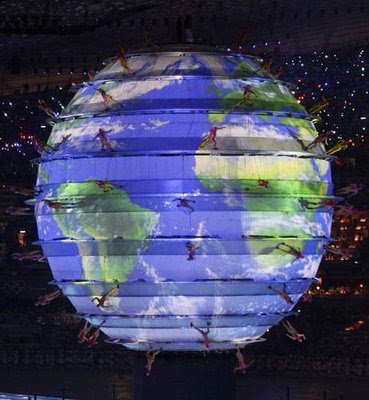 I liked the part where a giant translucent globe came out from the stadium floor and acrobats walking around it as if defying gravity. 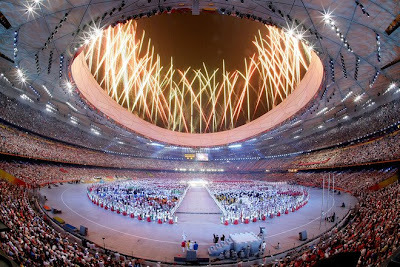 But the best part has to be the lighting of the Olympic flame. This was where we see six-time Chinese gymnastics gold medallist Li Ning carrying the torch being hoisted up to the top of the stadium and then did an incredible “kung fu style” walking the entire circumference of the stadium before sending up a torrent of flame that spiraled upwards to the huge cauldron and lighting the Olympic flame. Simply cool! And then of course there were the fireworks! Here’s some photos taken from Yahoo Sports. I only found the part where all the countries came out on stage a bit tedious and boring. Still overall it's a successful opening ceremony to the Games. And RTM had the nerve to end the live telecast prematurely before the fireworks show was over! Who wants to watch the RTM commentator in the studio talking nonsense when there's live fireworks on display? Please RTM, if you can't give us a decent live telecast, stop promoting yourself as the official Olympics Channel! 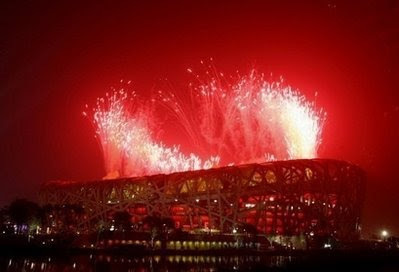 Anyway, here's wishing the Beijing Olympics a great success! At any rate, sorry you missed it. Always hated RTM commentators. Lucky we got Astro. The RTM is giving us very lousy coverage of the Games. 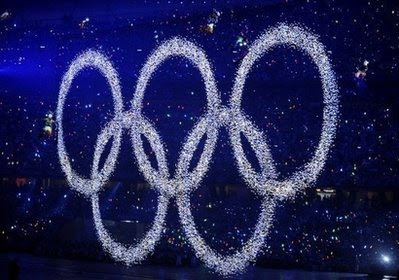 They don't even bother to show the entire opening ceremony. Pity us without astro. jacqueline, i will catch it on YouTube again, thanks! bengbeng, wah so strict one, your mrs! But you worse, rather go to gym than watch Olympics? But I guess if you can't watch it at home, might as well go to gym - anyway you can have the whole gym to yourself as most will be watching the live telecast! Err, don't your gym have TVs? acura, ditto. But I choose not to get Astro cos not much time to watch so will be a waste of $$$. Even for F1, I think RTM did not always gave us live telecast - it was delayed sometimes. last time 8tv always showed live, not delayed. Nice photos you have there! I love the part where they have 2800 people playing the drums and when they switched off the lights, you can see the sticks moving in unison! Yes, that part where Li Ning scaling The wall to ignite the Olympic flame, super awesome!!! Another one would be where they have people 'running across the globe'. Couldn't imagine how those running at the 'southern hemisphere' managed the feat. LOL! ps: During the boring introduction of the participating countries.. I only looked at the cheerleaders. Haha! Yeah, it was sad that RTM did not cover the entire opening - lots of people would have benefitted. It is times like this that I am glad I have Astro. The opening was nothing short of spectacular - another feather to Zhang Yimou's cap and for China. Nice photos, especially the first one. I haven't got my post up yet. Intend to at least have the pictures up. Looking out for the DVD. I'm sure someone will capitalise on it. FoongPC, thanks for visiting my blog and for sharing your thoughts. Aaargh, I've not seen anything on RTM for ages my fren. The way you say it, it has not improved over the years! I personally love the very beginning stage when they were counting down for the auspicious moment to arrive! That was like....wooooaaah! And I thought we had the worst coverage here in Manila! Anyway, it's going to be more than two weeks of sports coverages so I hope our networks will find time to redeem themselves. What a way to start the great Olympics! This would be hard to match up to for the next host, England. my bug life, I like the globe one too! bongkersz, haha! The cheerleaders are better to look at than the participants from different countries, no? happysurfer, good thing you have Astro. Thanks for dropping by! charmainezoe, yes absolutely fantastic opening! dan's portal, RTM definitely did not improve over the years! I definitely will watch the first 30 minutes which I miss! monaco, what to do? If want to watch good quality live telecast, must watch it on paid tv! acura, maybe it's time you get Astro? cc, I think England will definitely have a tough time beating Beijing. maiylah and monica, what? You missed the opening? You missed something great! But no worries, just watch the repeats or maybe on YouTube. 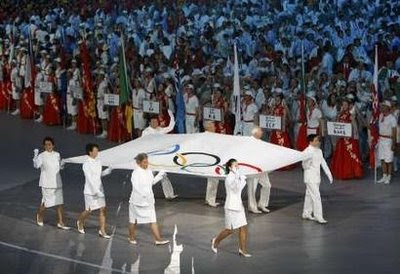 The most lavish and memorable Olympic Game/Opening. 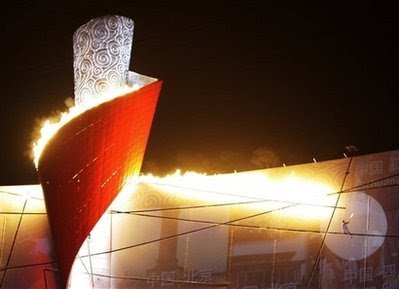 But I like more the Sydney and Barcelona Olympic cauldron lighting. normand, thanks for dropping by! I like Sydney Olympic cauldron lighting too, don't quite remember Barcelona's. let this be the best games ever! 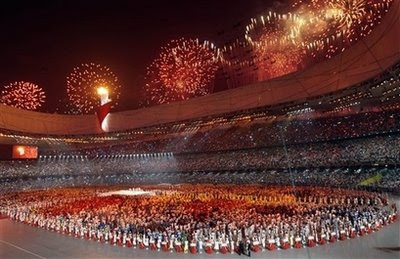 :) seeing back the pics make me just feel so proud for china. Yes, me too. So proud of China.